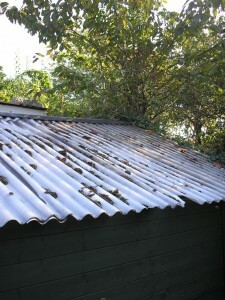 As mentioned in the earlier post, I used to have some corrugated PVC on my shed roof and although it let in lots of light it also also let any heat out and then baked in the summer. There were also a selection of leaks. So I needed to replace the shed roof. I was important that I still had the light but I also wanted to have better thermal insulation and keep the budget from skyrocketting. My other constraint was that I did not want to loose any roof height with the new roof. Again to control costs, I needed to be able assemble the roof myself so that restricted me with regards to large or specialist materials. The solution was a three layered design like an icecream sandwich. The inner later was to be tongue and groove cladding, the middle a wooden framework containing insulation and the top which was a sheet of OSB. The whole thing was then topped with roof felt. On the south side I incorporated a sheet of polycarbonate to act as a window. 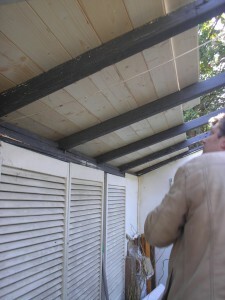 The first layer of cladding was simple to add, being simply nailed in place. Luckly my helper spotted that the roof was not square and we compensated for this by adjusting the spacing of one end of the planks so that the top plank lined up nicely with the roof ridge. 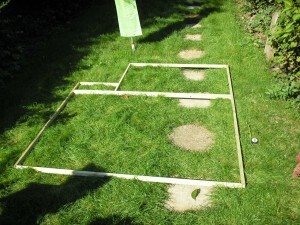 The middle was built as a frame on the grass. Although the shed looks rectangular from the front, it has a corner missing where the cupboards have been added on one side. This made the first frame tricky to build. 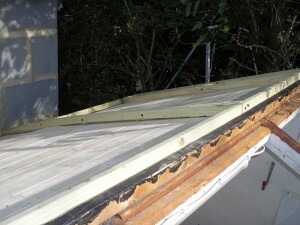 The roof was also not flat so long screws were used to bend the frame into place. 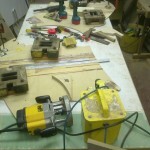 Extra bracing was added to stop the wood from cracking. We used drywall screws as they are coated to avoid corrosion, thin and self pilotting. However on some of the older timbers we did drill pilot holes as the wood had hardened. 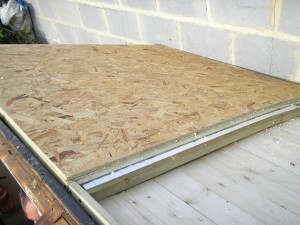 This was then filled with insulation and a sheet of OSB was screwed to the top. 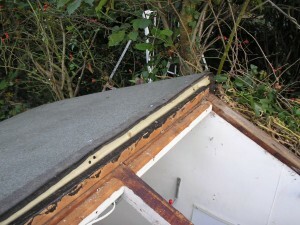 The water proofing was provided in the form of 2 layers of felt. The first was an underfelt which does not have stone chippings on it. 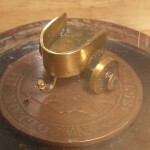 The top later was a traditional cap sheet which had some nice green stone on it to protect the bitumen layer underneath. I had origionally thought about using a bitumen mastic to glue the felt in place but we decided to nail the felt down using clout nails. The two of us assembled this half of the roof in a day. This was made easier by the fact we could access the roof from ladders inside the shed. In the final part I’ll tell you about how the window was fitted. 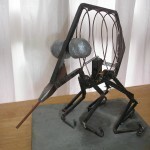 Thanks again to Alan from 2020 media for his help and his acrobatic skills hanging upside down nailing in the felt.